With an aim to “establish a more consistent connection with tourism industry stakeholders,” the Bermuda Tourism Authority has launched an online stakeholder portal called BTAConnect. 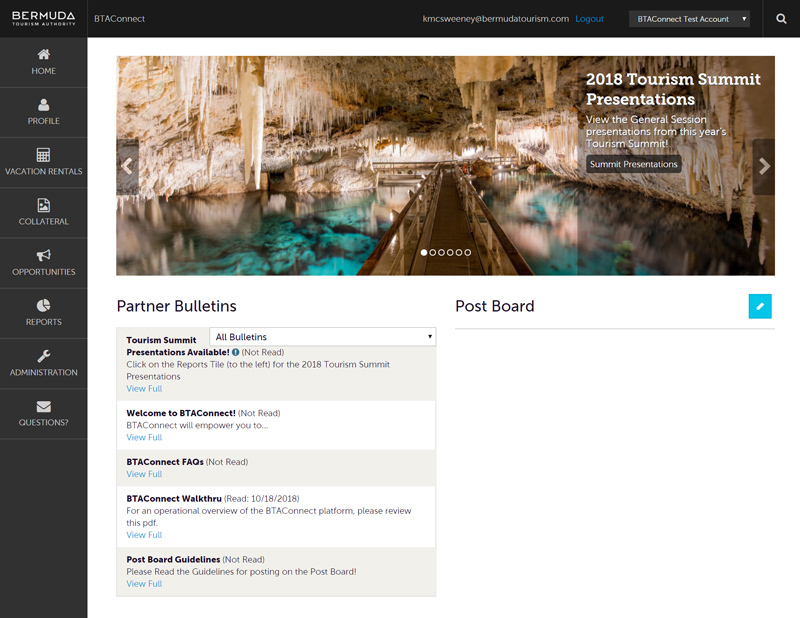 The portal was first unveiled at the Bermuda Tourism Summit last week and is a resource to engage the tourism industry around a variety of important strategic initiatives, including the recently released National Tourism Plan. “While we convene as an entire industry once per year for the summit to talk about tourism strategy, BTAConnect will help us stay better connected between summits and share information regularly throughout the year,” said Bermuda Tourism Authority CEO Kevin Dallas. BTAConnect is a platform for key developments, events and opportunities around the tourism industry as well as the latest research and performance data. Stakeholders who want to access the portal go through a short vetting process before getting a login. The BTA said, “Beginning today, stakeholders can find key presentation information from last week’s summit and soon it will be the location for the full National Tourism Plan. Only stakeholders with a login will have access to the information at BTAConnect. “This allows some controls over proprietary or competitively sensitive information. Often times, a version of information kept behind BTAConnect’s security wall is also publicly available from the Bermuda Tourism Authority’s website. “The National Tourism Plan, which includes an executive summary already publicly available online, called for a central online portal for all tourism activities and events. “Stakeholders can upload tourism-related event information that, once vetted, will be published for visitors to see on GoToBermuda.com/Events. Local businesses can also manage their GoToBermuda.com business profile via the platform. This tactic of getting information to visitors more directly falls under the National Tourism Plan’s Innovation chapter. “Stakeholders can also communicate with each other using the portal and review Bermuda Tourism Authority press releases and press clippings about the destination. Vacation rental property owners can use BTAConnect seamlessly to remit guest fees collected from visitors staying in their homes. Other uses will emerge as needs arise.